The new 2019 Toyota Yaris has a new look and offers a fun drive as well as abundant comfort and safety features. Previously the Yaris iA, the 2019 Yaris will be offered in three model types including the sporty L, the well-equipped LE grade, and the new premium XLE grade. The new Premium grade is packed with upscale features previously not available on the Yaris. New Yaris XLE owners will enjoy sporty leatherette seat surfaces, leather-trimmed steering wheel, shift knob and parking brake, an HVAC system with Automatic Climate Control, automatic LED headlights, rain-sensing wipers and illuminated entry. Other new features for the Yaris include a new sport-inspired front grille with a honeycomb insert design. Exterior styling cues include upscale piano black accents and chrome trim. Fog lights come standard on the LE and XLE grades, and these grades also sport a new rear lip spoiler. All 2019 Yaris models also have a roof-mounted, shark fin antenna and standard SiriusXM satellite radio with three-month All-Access trial. 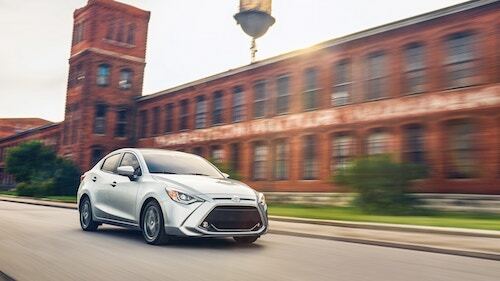 The 2019 Toyota Yaris is powered by a 1.5-liter DOHC four-cylinder engine that delivers 106 horsepower and 103 lb.-ft. of torque. Manual transmission is standard and features a compact, lightweight design with a short-throw shift for smooth, quick gear changes. Automatic transmission is also available. New standard safety features on the Yaris include Toyota’s Active Safety System with Dynamic Stability Control (DSC), Traction Control System (TCS), Brake Assist (BA), Electronic Brake-Force Distribution (EBD), Anti-Lock Brake System (ABS) and a Brake Over-Ride System (BOS). Our Rochester Toyota Dealership has the 2019 Toyota Yaris in stock now. If you would like more about this new Toyota car please contact us or stop by for a test drive.